We can perceive things, in many respects, as they really are. Nonetheless, our perception of the world is perspectival. You can correctly see a coin as circular from most angles. Yet the coin looks different when slanted than when head-on, and there is some respect in which the slanted coin looks similar to a head-on ellipse. Many hold that perception is perspectival because we perceive certain properties that correspond to the "looks" of things. I argue that this view is misguided. I consider the two standard versions of this view. What I call the pluralist approach fails to give a unified account of the perspectival character of perception, while what I call the perspectival properties approach violates central commitments of contemporary psychology. I propose instead that perception is perspectival because of the way perceptual states are structured from their parts. Psychologists and philosophers of mind speak of mental states as having part-whole structure. For example, the state I am in when I perceive the shape of a bare tree may have as constituent parts my states of seeing the shapes of the tree’s branches. What does it mean to say that a mental state has other mental states as parts? One way to address this question is to identify the contribution that structural claims make to psychological theories. However, a common assumption is that claims about how mental states are structured are not empirically meaningful except in the context of claims about the processes that produce and employ those states. I argue that this assumption ignores an important explanatory project in psychology and that it is this explanatory project that determines what structural claims, in their own right, contribute to psychological theories. Perception is rife with context effects, in which the way one represents one element of a scene depends on one's representations of surrounding elements in the scene. For example, whether I represent a surface as lighter or darker depends on how I represent the surface's surrounding environment. If perceptual states are semantically compositional, then what color, shape, orientation, etc., a perceptual state of a given type functions to represent should depend entirely on facts about that perceptual state's constituents and how they are combined and should be indifferent to facts about any other perceptual states. Perceptual context effects raise the question of whether it is generally possible to develop empirically plausible, informative accounts of perception as having a compositional semantics. My goal here is sketch how such accounts can be developed in a way that handles context effects. Mental states are complex. The state I am in when I see a red square is made up of my states of seeing redness and squareness. The state I am in when I see a family of deer is made up of my states of seeing each individual deer. I argue that the very structure of a complex perceptual state––the way it is composed of its parts––carries commitments about how the things perceived are ecologically arranged. We don't just see how things are spatially related, for example; spatial relations are embodied in the very formsof our perceptual states. By looking at what the structural forms of mental states commit them to, we can better understand the fundamental differences between various mental capacities, including our capacities for perception and for high-level, rational thought. Seeing provides a basic form of mental contact with parts of the world. What is it to see something? One common view is that someone’s seeing something corresponds to someone’s succeeding in visually referring to it. I argue that this view requires refinements. One can succeed in visually referring to things that one cannot see. For example, humans and other animals have the capacity to visually refer to and accurately represent hidden fragments of partially occluded objects. In general, visual reference to one part of a scene can rely on visual references to other suitably related parts of the scene. Our perceptual capacities exploit the complexity and redundancy inherent in the environment in order to fix onto parts of the world, both visible and hidden. I argue that seeing corresponds only to a subclass of cases of visual reference. 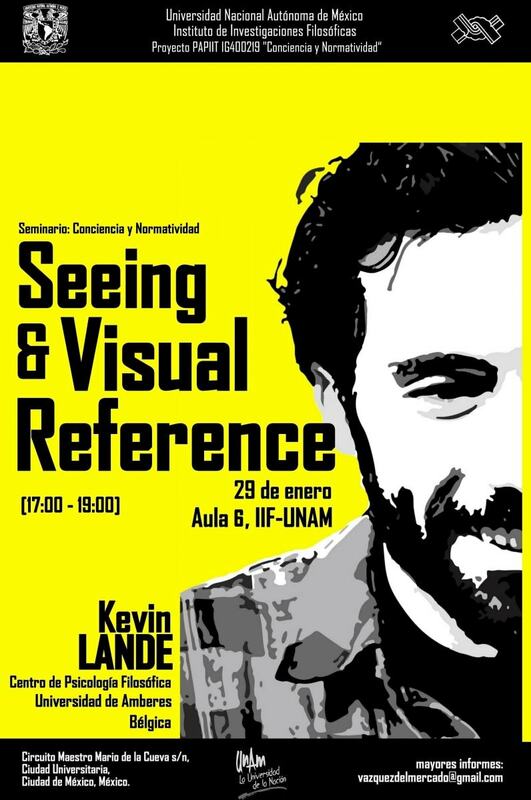 This subclass has semantic, constitutive, and epistemic priority over other cases of visual reference. Yet it is visual reference in general, and not seeing in particular, that matters for perceptually fixing onto and accurately representing a given part of the world. ‘The brain is a computer’ – this claim is as central to our scientific understanding of the mind as it is baffling to anyone who hears it. We are either told that this claim is just a metaphor or that it is in fact a precise, well-understood hypothesis. But it’s neither. We have clear reasons to think that it’s literally true that the brain is a computer, yet we don’t have any clear understanding of what this means. That’s a common story in science. Do ants have any idea where they are and where home is at? When they go out into the world, do they grasp how far they have gone or what turns their path has taken? Desert ants (Cataglyphis) are able reliably to return to their homes, having left them in search of food. But the ability to reliably get back home does not imply that one has an idea, a mental representation or map, that specifies where in space home is located. Reflecting on why not helps us to get some purchase on a broader question: What sorts of abilities, or behaviors, indicate the presence of such mental representations? What abilities or behaviors indicate the presence of mind?